You know your lawn needs to be tended to, but did you know tree and shrub care is important, too? Here, we break down how to care for the other living organisms on your property. Trees and Shrubs need to be fed yearly so that insects and drought concerns are greatly reduced. 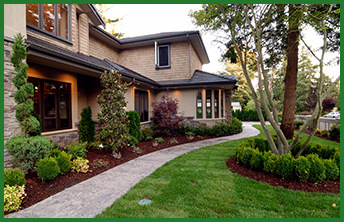 Our customized nutrient blend helps to establish new trees and shrubs. It also helps to build a more fibrous root system. How? It helps the roots to absorb more moisture and nutrients from the soil. More moisture and nutrients allow the plants to be able to survive harsh conditions like drought, harmful insects and diseases. Needs to be fed more regularly as the grass has a smaller root system and sustains wear and tear that the trees and shrubs do not. 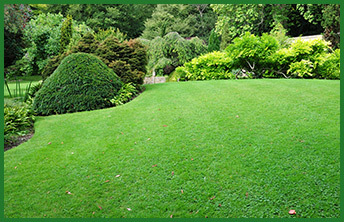 Thick green grass reduces pest and weed infestations. Thick healthy lawns provide oxygen; filters unwanted substances from entering our watershed system. Due smaller less fibrous root systems grass needs to be fed regularly. Our programs are specifically designed to ensure your lawns are fed and monitored for weed and pest infestations and to ensure a healthy green lawn. There are many insect invaders of our ornamental trees and shrubs which feed on and make their homes in the bark, branches, and trunks of trees. This can damage the appearance and weaken the trees and shrubs for secondary problems such as diseases. Feeding strengthens the root system and enhances the vitality of the plant causing it to grow fuller and stronger with more color and beauty. Just one application of our customized deep root fertilizer blend can help to increase your plant’s annual growth rate by as much as 20%! Proper tree and shrub care will help your newly planted trees and shrubs establish faster and have less of a chance of dying off prematurely. On top of this, your already established trees and shrubs will survive drought and other pressure better with a stronger more developed root system. Ready to take care of your trees and shrubs this year? You can sign up and pay online or give us a call to schedule our technicians.